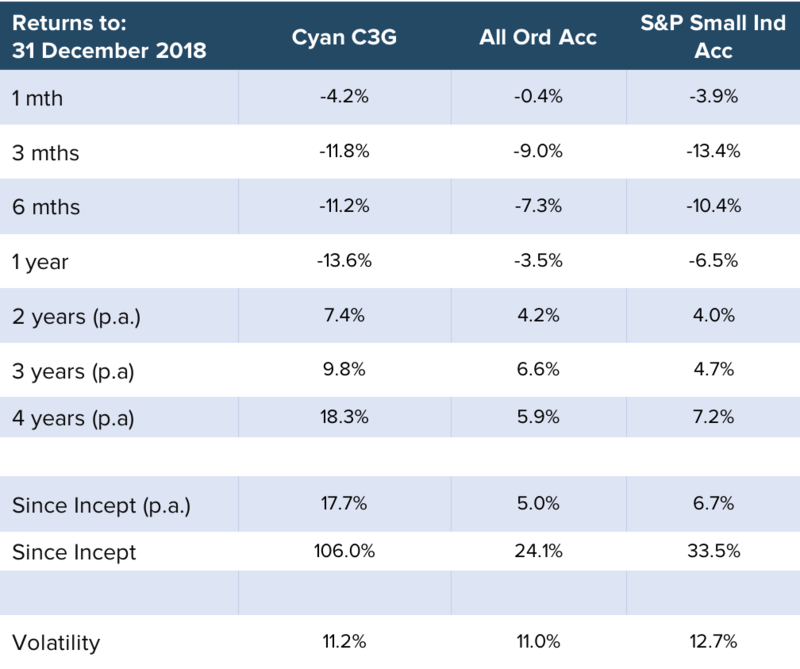 Despite the challenging backdrop of calendar 2018, thanks to gains made in more favourable markets, the Cyan C3G Fund continues to post solid longer term annualised returns of 18% p.a. over 4 years. The negative Fund return was not attributed to any adverse stock specific news in December, a characteristic we tend to think is somewhat reassuring. In light of the bearish conditions, the Cyan C3G Fund experienced 4 positions that rose, 3 that were flat and 17 that fell. There were certainly some major falls in the market including BWX (-52%), BlueSky (-22%), Class (-23%), IOOF (-25%), GTN (-47%) and Pinnacle (-21%) that we were happy to have avoided. Murray River Organics (MRG -16%) produces organic fruits and nuts with 13 properties in the Sunraysia region of Victoria and processing and packaging facilities in Melbourne. The Fund subscribed to a capital raising priced at significant discount to the net tangible value of the business. We believe as the new management begins to leverage the existing $68m in sales, significant value in the business will be unlocked. Experience Co. (EXP -13%) – our long-term holding in this adventure tourism company had a bit of a rebound in November but gave most of those gains back in December, possibly due to the poor weather in Qld (which occurs with some level of ferocity every year). EXP is likely to be a major beneficiary of the weak AUD which has found itself nearing 10 year lows and has historically been a significant driver of tourism volumes. AMA Group (AMA -14%) speaking of poor weather, smash repairer AMA is likely to see a run of work stemming from the severe Sydney hailstorm in December. Again it appears the stock was simply caught up in broader market selling. Livewire Markets tracked and reviewed over 1000 calls from ~50 fund managers participating in their weekly Buy Hold Sell videos series. The panel this year features the fund managers who had the highest successful hit rates and those who have made the best performing buy or sell calls. There are certainly some ‘green shoots’ appearing. Atomos (AMS), a ‘prosumer’ video technology company, in which we subscribed for a small parcel of shares in their IPO, listed in late December and rose more than 100% in the following days, clearly indicating that investors remain willing to back attractive investment themes. It’s probably good timing in the market for us to now start a new calendar year. There is no doubt 2018 was a disappointing one for investors. Of course we look back at decisions we wish we had made and those we wish we hadn’t. But that will happen every year. 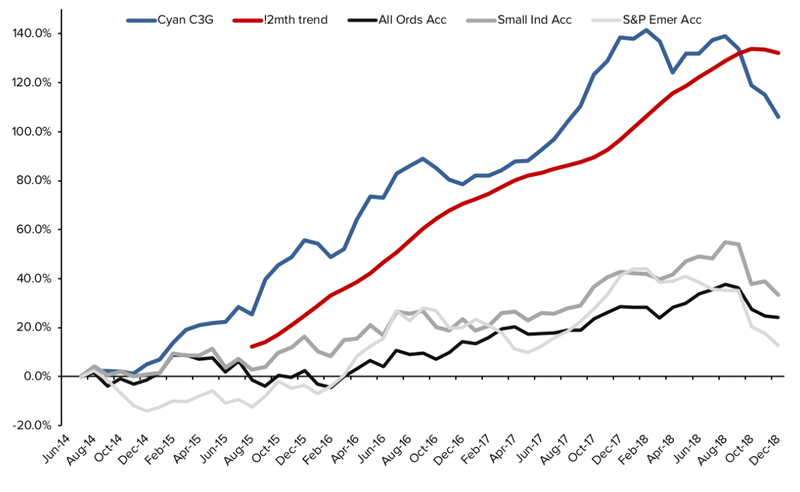 We look at individual companies rather than overall markets (although market sentiment does clearly influence our short-term decisions) and, given their strong growth profiles, we wholly believe that the companies the Cyan C3G Fund owns will have more intrinsic value at the end of calendar 2019 than they do presently. If the bearish market sentiment abates, we fully expect that value to be crystallised in rising share prices. As always we are contactable in person and encourage you to do so, particularly through the present market conditions.